19 New King Street is where William Herschel discovered the planet Uranus in March 1781. In doing so, he doubled the size of the known universe. What makes this achievement even more remarkable is that Herschel was a self-taught amateur astronomer, who built his own telescopes at home. Number 19 forms part of a terrace built around 1764. When the Herschels moved here for the first time in 1777, the bustling street was filled with the noise and mess of builders and the road was still un-metalled. The modest townhouse (laid out over five floors) is typical of the houses of ‘the middling sort’ – that is, artisans and tradesmen. 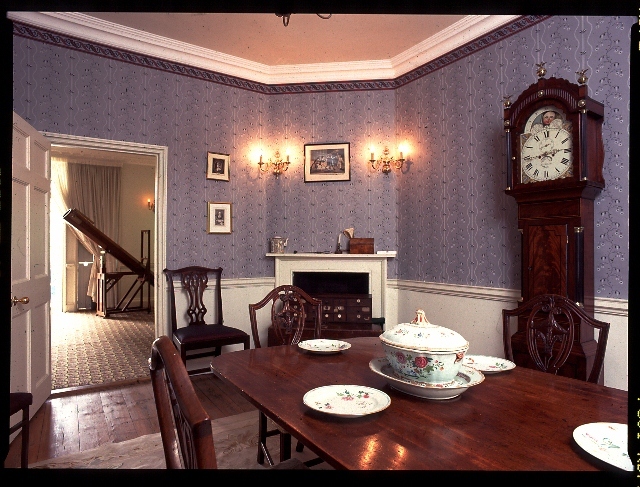 It is a contrast to the grand Georgian houses rented by visitors for the Bath season – such as No.1 The Royal Crescent (another historic house museum which, like the Herschel Museum of Astronomy, is run by the Bath Preservation Trust). The Grade II* listed building was purchased with the help of Doctors Leslie and Elizabeth Hilliard in 1981. The house has been fully restored in the authentic style of the period. Dr Brian May is the Museum’s patron – like William Herschel before him, both a musician and an astronomer. A gifted composer, William Herschel came to Bath in 1766 to try his fortune as a professional musician. He was later joined by his youngest sister Caroline, who journeyed from the family home in Hanover to run William’s household. Although Caroline was unused to being in the public eye and had only a smattering of English upon her arrival in Bath, she was soon performing soprano parts in concerts arranged by William. Both developed a passion for observational astronomy that was to change their lives. Remembering their life in 19 New King Street – the home of the Herschel Museum of Astronomy – Caroline noted that ‘almost every room in the house turned into a workshop’ with William ‘grinding glasses and turning eye pieces’ to build his famous telescopes. As well as discovering a new planet, William Herschel increased the known dimensions of the Milky Way, noted the rotation of Saturn’s rings, identified satellites of Saturn and other planets, and observed the motion of binary stars. Through his observations of the sun, he also detected the existence of infrared radiation – an energy source now used to power space missions. In 1782, William was awarded the title of King’s Astronomer and went on to build a series of even larger telescopes. The greatest of these – but not the most accurate – was a forty-foot telescope, which impressed George III and his family with its scale. Acclaimed at the time as a marvel of the age, this gigantic telescope had a speaking tube on the observer’s platform, which enabled William to communicate with his sister Caroline at ground level. William publically acknowledged Caroline as his ‘astronomical assistant’ but she gained a reputation as a pioneering astronomer in her own right and was paid for her scientific work. She discovered eight comets (one of which is named after her). Before her death at 97, she received numerous awards – including the prestigious Gold Medal from the Royal Astronomical Society in 1828. As a child, Caroline had contracted smallpox (scarring her face) and typhus. Cruel treatment from her mother and spoilt eldest brother Jacob (who treated Caroline as a drudge and had her whipped) and the effect of these diseases stunted her growth. She never grew taller than 4’3”. Caroline adored William, especially after he rescued her from her miserable life in Hanover. She was taken aback when he unexpectedly married a rich widow in 1788. William’s son, John Herschel, inherited the family talents for astronomy and music. John completed his father’s life work of mapping the heavens by plotting the skies of the Southern Hemisphere from an observatory he built in the Cape of Southern Africa. Celebrated as a natural philosopher with many scientific interests, John is also remembered for his pioneering work in the field of photography. Herschel was born in the Electorate of Hanover in Germany, then part of the Holy Roman Empire, one of ten children of Isaac Herschel by his marriage to Anna Ilse Moritzen, of German ancestry. His father was an oboist in the Hanover Military Band. In 1755 the Hanoverian Guards regiment, in whose band Wilhelm and his brother Jakob were engaged as oboists, was ordered to England. At the time the crowns of Great Britain and Hanover were united under King George II. As the threat of war with France loomed, the Hanoverian Guards were recalled from England to defend Hanover. After they were defeated at the Battle of Hastenbeck, Herschel’s father Isaak sent his two sons to seek refuge in England in late 1757. Although his older brother Jakob had received his dismissal from the Hanoverian Guards, Wilhelm was accused of desertion (for which he was pardoned by George III in 1782). Wilhelm, nineteen years old at this time, was a quick student of the English language. In England he went by the English rendition of his name, Frederick William Herschel. In addition to the oboe, he played the violin and harpsichord and later the organ. He composed numerous musical works, including 24 symphonies and many concertos, as well as some church music. Six of his symphonies were recorded in April 2002 by the London Mozart Players, conducted by Matthias Bamert (Chandos 10048). Herschel moved to Sunderland in 1761 when Charles Avison immediately engaged him as first violin and soloist for his Newcastle orchestra, where he played for one season. In ‘Sunderland in the County of Durh: apprill [sic] 20th 1761’ he wrote his Symphony No. 8 in C Minor. He was head of the Durham Militia band 1760–61 and visited the home of Sir Ralph Milbanke at Halnaby Hall near Darlington in 1760, where he wrote two symphonies, as well as giving performances himself. After Newcastle, he moved to Leeds and Halifax where he was the first organist at St John the Baptist church (now Halifax Minster). He became organist of the Octagon Chapel on Milsom Street in Bath and the City’s Director of Public Concerts. He was appointed as the organist in 1766 and gave his introductory concert on 1 January 1767. As the organ was still incomplete, he showed off his versatility by performing his own compositions including a violin concerto, an oboe concerto and a harpsichord sonata. The organ was completed in October 1767. His sister Caroline came to England in 1772 and lived with him here in New King Street, Bath. In 1780, Herschel was appointed director of the Bath orchestra, with his sister often appearing as soprano soloist. Various vocal works including a “Te Deum”, psalms, motets and sacred chants along with some catches. This link takes you to the BBC Music website where you can listen to and download several recordings of William Herschel’s music.